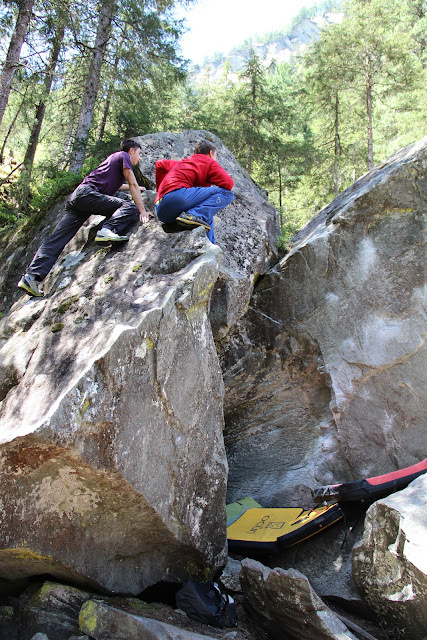 Magic Wood is Magic Good, the first day was encouraging, Flashing Flown Away 7B after ticking off the entire Höhen Boulder 2nd shot (7A, 7B+, 7C). We then went down to the river bloc for the Grit delux, a no hands mantle to crimps with smears. Total anti style. Fred flashed it. Rene and I rode the send train. The weather here hasn't been the best. To my knowledge the river hasn't flooded this bad in 2 years. In the last 2 weeks it has flooded twice. 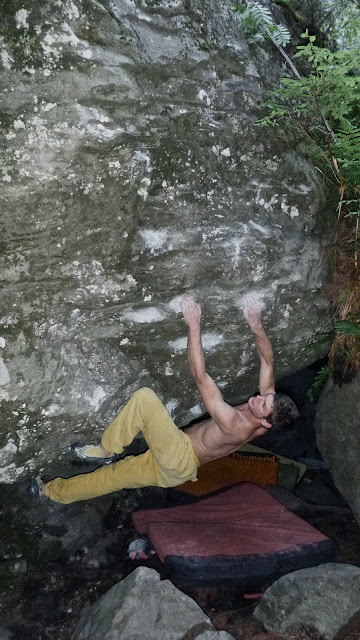 Before Bruno Bloc (home to the Neverending Story) went under, I did both Supernova 7C and Du Côté du Seshuan 7C+. Both are exceedingly cool although the latter is without a doubt the most amazing line I've ever climbed. Unless you are solely a slab climber, this line has it all; overhanging slopers, crimps, smearing, a kneebar, a mantle, a no hands-rest and a dyno. A total classic from Fred Nicole. Other lines soon went down including From the Darkness to the Sunshine 7C+ and a flash of Intermezzo 7C. Coupled with a few more 7C's and a small score of 7B's I've got enough under my belt to make the 5 forced rest days of rain bearable. It's been a week and a half since arriving and I've so far managed 34 problems above 7A. I'm one off my goal and an 8A might be a nice trip-ender. But we'll have to wait and see what the week brings.